The callsign VLH has been shared consecutively by transmitters at three different locations in the South Pacific; two ships and a land based facility. The two ships were plying the Pacific under the maritime flag of New Zealand, and the land based transmitter was located within a now historic shortwave station in Australia. The SS Hauroto was launched for the Union Steamship Company of New Zealand at the William Denny shipyards at Dumbarton in Scotland in 1882. This ship, the Hauroto, was named in the Maori language in honor of a small lake and river in the South Island of New Zealand. 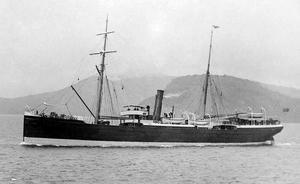 This passenger/cargo ship sailed the waters of Australia and New Zealand, and also along coastal China. It was later sold to a Hong Kong maritime company, and it sank during a typhoon off the coast of China in 1919. During its latter years, the Hauroto carried wireless equipment which was licensed by New Zealand under the callsign VLH. The SS Kaiapoi, a small cargo vessel, was launched at the Osbourne Graham shipyards in North Hylton Sunderland in England in 1906. This ship was built under the planned name Holywood, but when it was taken over by the Union Steamship Company of New Zealand, it was renamed Kaiapoi, another Maori name, in honor of a small town in the South Island. The Kaiapoi was sold to Hong Kong in 1930; and in 1939 while carrying a load of coal, it ran aground and was wrecked at Wenchow Bay in China. In the era when wireless became radio, the callsign VLH was applied to this ship the Kaiapoi, during its earlier time of service under the maritime flag of New Zealand. The third application of the callsign VLH refers to a 10 kW shortwave transmitter that was installed at the ABC-PMG wireless station near Lyndhurst in Victoria. In 1928, a small galvanized iron shack was constructed on the brow of a small hill near Lyndhurst, and a small 600 watt experimental shortwave transmitter was installed. Over a period of many years, the power of this transmitter was increased incrementally to 10 kW; and the callsign applied to this unit was 3LR, and then VK3LR, and ultimately to VLR. A second shortwave transmitter was installed in 1941, and this new unit was identified under the callsign VLG. This unit served under both the ABC with programming for the outback and New Guinea, and also with the Overseas Service of Radio Australia. A third new transmitter at 10 kW was inaugurated at Lyndhurst on January 21, 1946 under the consecutive callsign VLH. At this stage, the 1935 building was still standing, the second at that location. This new unit VLH carried the Inland Service from mediumwave 3LO and the intended coverage area was the Northern Territory and outback Queensland. There were brief periods each day when all three of these shortwave transmitters, VLG VLH and VLR, carried the same programing. These daily bulletins of Inland News were broadcast specifically over the shortwave transmitters only. In the late 1950s, a new building was constructed over the old building at Lyndhurst, and the old was then removed. In 1956, three new transmitters at 10 kW were installed. These were American made RCA units, Model ET457X, that were originally designed for installation in battleships that were declared surplus. Ten years later again, another eight new transmitters at 10 kW each, Australian made STC Model 4SU488, were installed. For a period of more than three months, the ABC-PMG transmitter VLH at Lyndhurst was also in use for the relay of programming from Radio Australia. Beginning on January 2, 1951 and ending on April 10, VLH5 on 15230 kHz carried the Radio Australia French Service for Tahiti. Then three years later, from December 17 - 23, 1954, VLH9 carried Radio Australia in French to Tahiti on 9580 kHz, and VLH15 to French Indo-China. This brief change in scheduling occurred during the broadcast of additional transmissions from Radio Australia for coverage of international tennis and cricket matches. Interestingly, during the early 1980s, there were two 10 kW transmitters at Lyndhurst carrying the same relay of ABC programming under the one callsign VLH. From 0830 UTC till 0915 UTC daily, both VLH9 on 9680 kHz and VLH15 on 15230 kHz ran the same program service for a daily overlapping period of three quarters of an hour. The final broadcast from the ABC-Radio Australia-PMG shortwave station at Lyndhurst ended at 1502 UTC on Friday June 12, 1987. This last transmission was from VLH9 on 9680 kHz; and then the station fell silent. Three transmitters from Lyndhurst were re-installed at Brandon Queensland for the Radio Australia service to Papua New Guinea, and four were reinstalled at Llandilo for the VNG chronohertz time signal service. In 1961, Radio Australia dropped the announcement of callsigns on air, though the callsigns, or abbreviated callsigns, were still used to identify specific program lines to the various transmitter sites. For example, in 1977, there were ten program lines running from the ABC and Radio Australia studios in Melbourne to the Lyndhurst shortwave station. Radio Australia utilized at least two of these feed lines one of which was apparently identified with the callsign VLH or just H.
The first QSL card for the ABC usage of the VLH transmitter was printed with red ink on a white card. Subsequent QSL cards verifying the reception of the VLH program service were the regular ABC cards, postcard size and subsequently larger, always depicting a map of Australia with all station locations identified. There are no known QSL cards verifying the Radio Australia usage of the VLH transmitter. However, there must be at least a few out there, maybe somewhere in New Zealand or Australia, or perhaps even over in the United States. Do you have one? Then do let us know!